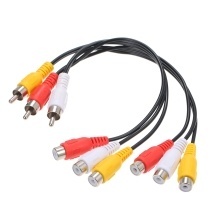 Audio Video Cable offers you a convenient way to connect your DVD, TV, STB and other AV devices. Gold plated cable ensures stable signal and less interference. Made of premium copper and double shielding for maximum signal quality. Applicable for DVD, television and STB and other devices with AV interface. Hi-Fi design secures pure sound and enjoy wonderful world. Premium shielding cable effectively avoid interference.